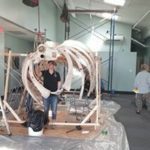 Spinnaker was a whale, well known to researchers at the Center for Coastal Studies since her birth in 2004. In 2006 she was first disentangled by the Center’s Marine Animal Entanglement Response team, a leading marine mammal rescue group in the world. Spinnaker, again was reported entangled in 2013 and the team traveled to Bar Harbor, Maine to free her once again. Less than nine months later, she was reported entangled again and this time the team traveled, with the assistance of the Coast Guard, ninety miles off-shore to free her once again. Their efforts, however, were in vain, for what the team did not know was that lodged between her jaw bone and muscles, with tissue growing around it, was a small piece of rope that had basically cut her upper jaw in two. This unseen entanglement resulted in her untimely death just over a month later. 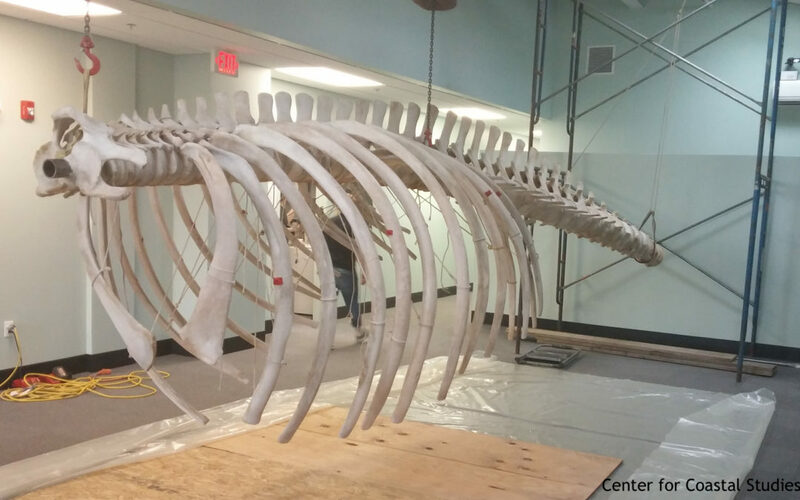 For two years the center has been cleaning the skeleton and it has recently been hung in their newly renovated Hiebert Marine Labaratory, creating an interpretation center. CARE is funded a touchscreen that shares details about Spinnaker and the center’s disentanglement work. You may learn more about Spinnaker and access the touchscreen by visiting this link.